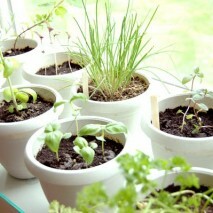 When the weather starts to turn cold, I start to think about what herbs i can start to grow indoors. I like to stick to a few easy-to-grow basics like the ones on the list below, which offers a hierarchy of 8 of my favorite easy-to-grow herbs, ranking them from easiest to most difficult to grow. Technically, you don’t even grow lemongrass, in that it’s not planted in soil, making this one incredibly easy herb to keep in the house. When buying a stalk at your local market, look for plenty of stem and make sure the base is intact. Trim the top and place the stalk in a couple inches of water. The stalk will produce roots and dozens of new shoots. These are one of the easiest herbs to grow indoors, as they do not require much light and are prolific in their production. Chives are easiest to start from an already-established plant. Just pull up a bunch from the established plant (including the roots), place it in a small pot half-full of potting soil, then cover the roots up to the crowns with more potting soil. Cut about one-third of growth off the top to stimulate new growth. Both spearmint and peppermint literally grow like weeds. They’re both very hearty and very invasive, meaning that they can quickly choke out other herbs. Keep in mind that a lot of spearmint is required to produce the same minty effect as peppermint, so if you’re growing it indoors, where space is limited and harvesting is frequent, peppermint is the better option. Start your peppermint plant with seeds—not root or leaf cuttings—in a small pot full of potting soil. Peppermint will thrive in shade, but make sure it’s in a spot where it gets at least a little bit of light each day. Parsley is one of the most commonly used herbs and is very easy to grow, though the seeds can be difficult to germinate and may take up to two weeks to see results. The good news is it doesn’t require much light or maintenance once you get it started. Keep in mind, though, that this plant is a fairly slow grower, so initial clippings will not harvest a lot. Coriander is the seed of the cilantro herb. This particular version of coriander is easier to grow than regular coriander, as it’s very hearty and very reliable. The Greek variety of oregano is easiest to grow; however all oregano requires six to eight hours of sunlight per day, so a well-lit window—particularly one with southwestern sun exposure—is best. This is another herb that requires six to eight hours of sunlight per day, and it may even need supplemental light. My favorite is lemon thyme, which can be used in place of regular thyme and has a unique citrus-like flavor and isn’t nearly as easy to find as other varieties in stores. This herb is very easily over-watered. It prefers to remain on the dry side and does not need particularly rich soil. Several varieties are available; some are bush-like and some are more of a creeping plant. Choose an upright variety like Tuscan Blue or Blue Spire. These will remain more compact, making them a better choice for indoor growing. Austin's Favorite Plant Care Specialist!